If you see them killing a goat, don’t get on the plane! Seriously, you really shouldn’t get on that plane. At least not if it’s run by Nepal Airlines. In case you missed this story of the kind of high-tech response to an aeronautical problem you can expect in some parts of the world, the folks who run Nepal’s state-run airline sacrificed two goats earlier this month. 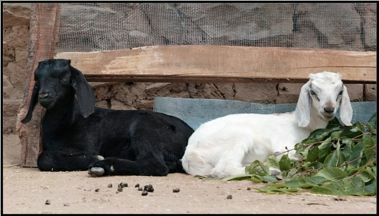 The goats were killed because there were technical problems traced to an electrical fault on one of the two 757 aircraft operated by Nepal Airlines. And when I say, “if you see them killing a goat,” what I’m referring to is that the airline had the two goats sacrificed right in front of the 757 while it sat at the Kathmandu international airport. Don’t think of this as some kind of Michael Vick thing though. The goats were killed in accordance with Hindu traditions to appease Akash Bhairab, the Hindu sky god. It is common in Nepal to sacrifice animals like goats and buffaloes to appease different Hindu deities, reported officials, who also said the plane is back in service now.